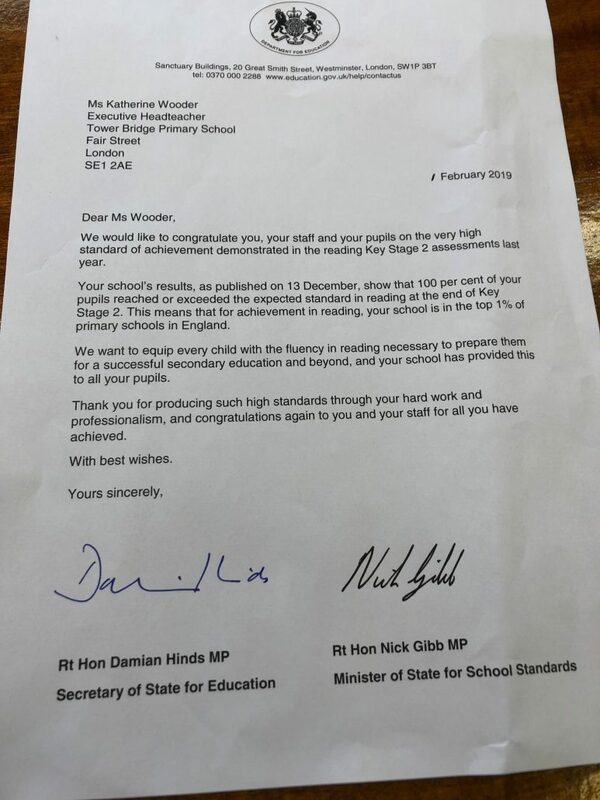 We are delighted to have received a letter from Rt Hon Damian Hinds MP and Rt Hon Nick Gibb MP to congratulate Tower Bridge Primary School on the amazing results achieved by the pupils in 2018 for reading. Tower Bridge Primary School is now in the top 1% of primary schools in England for reading. This is a fantastic achievement for the school and the federation. Thank you to all the staff, who work tirelessly each and everyday to provide a fantastic education for the children at The Bridges Federation. Thank you to all the parents and children who are committed to working hard and supporting the school and sharing the same aspirations.